Over the Memorial weekend, we organized a small group of Hikers and did a special place that does not get much maintenance. The Trails were overgrown, and in many places, non-existent. At one point during the Hike, were the group of 10 of us were actually Bushwhacking and taking pictures, three of us wandered a bit away from the main group. We decided to circle back to where we left the group and connect back up. I lingered for a moment to take some further pictures and then discovered I was alone with no Trails. I attempted to continue to circle and follow what I thought was the route the other 3 Hikers had taken to reconnect to the main group. After about 15 minutes, I stopped again and realized I could not hear or see either group. I started to use my Boy Scout whistle. It is a frequency that cuts through almost everything, to carry for over a mile. Normally. But with the very thick foliage everywhere, it apparently was not getting through to anyone. I yelled a few times in-between my whistle blows in every direction. No response. So I headed back to where the smaller group had originally broken away from the main group. I found the spot and no one was there. I continued to blow my whistle and yell in every direction. I listened……Nothing. So now, it had been over 45 minutes since I last heard or seen anyone from the group. I made my way back to what was our original Trail into the area. It was only kinda like at Trail. Still very overgrown. As I walked back down this Trail to our starting point, I would blow my whistle and listen constantly. Still nothing in response. At the car, I re-hydrated, took a short rest and listened carefully back into the confined area we where Hiking in. Not a human sound to be heard. I headed back down the original trail and was going to cover the exact route we had taken earlier in the day. About 1/2 mile down the trail, I run into the entire rest of the group. About 2 minutes before we re-connected, I could hear them yelling. I whistles back. When we met a couple of minutes later, No one in the group had heard my whistle, just minutes before up the trail. Apparently the deep/heavy foliage was trapping the sound and it was not traveling very far. We stopped there on the trail and compared notes. The group had been doing similar things that I was doing. Blowing whistles and yelling in every direction. I did not hear them and they never heard my calls as well. So what are some of the lessons here? 1. Even though this was a special hiking group, made up of all experienced Trails individuals, “I” should have never left the main group, being the leader of this Hike. NEVER. That is what started the entire situation. Just a bit of lax behaviour that got way out of control. 2. The main group should never have split up again, even after it had lost the leader. For a short time there was the danger of having a second person or persons, also disconnected from the main group. 3. Although this was a very experienced group of Hikers, and everyone eventually figured out just where they were, and the problem of being Lost was not an issue. The bigger problem of not finding one of the Hikers, and having that lone hiker hurt himself while being alone, could have turned this small problem into a nightmare. Injured and alone, “I” could have laid in the thick foliage, off of any main trail, for over a day or so to be eventually found by a search party. 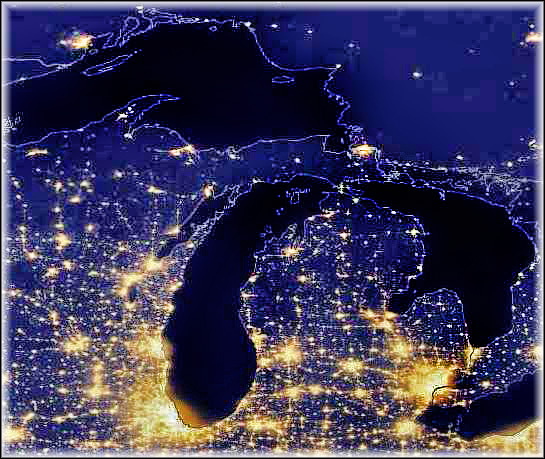 And that is what it would have taken to find me, if injured in this thick/dense area. ***It gets very easy for even the most experienced of Hikers, to forget the basic Rules of Group hiking. ALWAYS Stay together. Even with one member lost, the group needs to remain together rather then multiple their problems by splitting up. ALWAYS make arrangements for a meeting place out on the Trails or especially while Bushwhacking in dense Forest terrain. ALWAYS carry a whistle. If the group all had their own whistles, the odds of the lost member hearing one of the calls increases greatly. ALWAYS carry a Compass. Just like the importance of carrying extra Water on a Hike, just for occasions like this one. Or that stash of additional Insect Repellent. (the area was so thick with foliage that the SKEETERS where, at times, in swarming mode. This can be very distracting) Some additional things MUST be added to your regular Hiking gear and routine, when you will be Bushwhacking. Thick forest foliage, intense Insect behaviour, and the ease at which the entire Group can get turned around, increases tremendously in a Bushwhacking scenario. Never figure that you know so much about the outdoors that there is no need for discussions with the rest of your Group. Emergencies happen. And when they do, those advanced discussions can be the saving Grace. You NEVER know to much and you NEVER can remember it all. 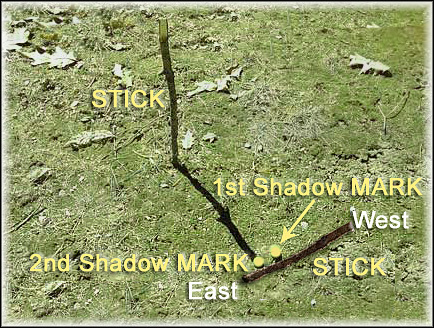 I know I have written about Ticks many times here and in the HM NewLetter, but I cannot talk about them enough. With all the precautions and Insect Repellent, Flash-lights, whistles and things we carry out on the Trails or keep in our Car Hiking Kits, a Tick remover and just plain checking ourselves is something on the top of the list of Hiking preventions. 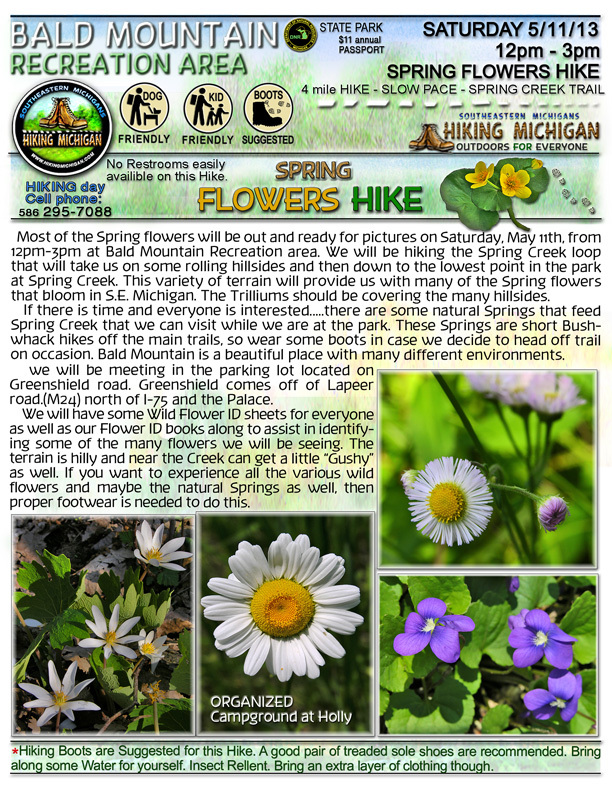 On our last Hike, Spring Flowers at Bald Mountain, we discovered the Ticks have returned and are out on the Trails. I was walking down our final Trail leg when a fellow Hiker said…….Rob…..Stop. He said it in a way that made me realize it was important, so I froze on the Trail. He pulled out his “Multi-Tool” and with the Pliers, slowly removed a Tick that was crawling up my back towards a Ticks favorite spot. The warm, moist area around my neck/hair-line. Michael then removed the Tick and killed it. We laughed for a moment with the understanding that there are millions of Ticks and he had just eliminated ONE. But that was one less Tick available to bite someone else. Really now…..He could have just brushed the Tick from my back, but he wanted to not have that Tick jump onto someone else, further back in the line of Hikers. When we returned to the Parking area we did the infamous “Tick Dance”. A simple task that can be so very valuable in preventing a Tick infestation. We all shook-off our clothing, took our fingertips and rubbed through our hair, hair-line and under and around our socks. These are the most likely spots a Tick will invade our privacy. They like those warm, moist places on us, so that is where they usually head once they have dropped or jumped onto our bodies. Doing these checks after a Hike can very often stop what could have been a bad situation, later. Getting a Tick removed before it has started to bite or even shortly after it has started to bite into us can be very important. My personal regiment for heading outdoors and being as protected as possible is a covering of DEET Insect repellent over 30%. I always shower after an outdoors experience of any sort. And of course there is the Tick Dance there in the Parking lot, and more checks during my shower. Ticks carry a number of diseases and problems. Some of which can be extremely harmful if the Tick is left un-noticed, un-removed and allowed to run it’s full cycle. This is true for our Doggie friends out on the Trail too. They are even more susceptible to getting a Tick then we are. They are closer to the ground and brush up more foliage then we do while out on the Trails. On a North/Central HIKE last year, the entire Group did the Tick Dance after the Hike. Everyone was clean. But the Dogs were not. One had 6 Ticks and the other had 8 Ticks. Working together we removed all of them. Cannot even imagine what this did for the health of these Dogs. You are not going to die if you get a Tick, but the problems you may experience and the possible diseases you may get from a Tick bite is worth these small things to stop it from happening. It is all well worth the efforts to not get a Tick bite for you or your Dog. 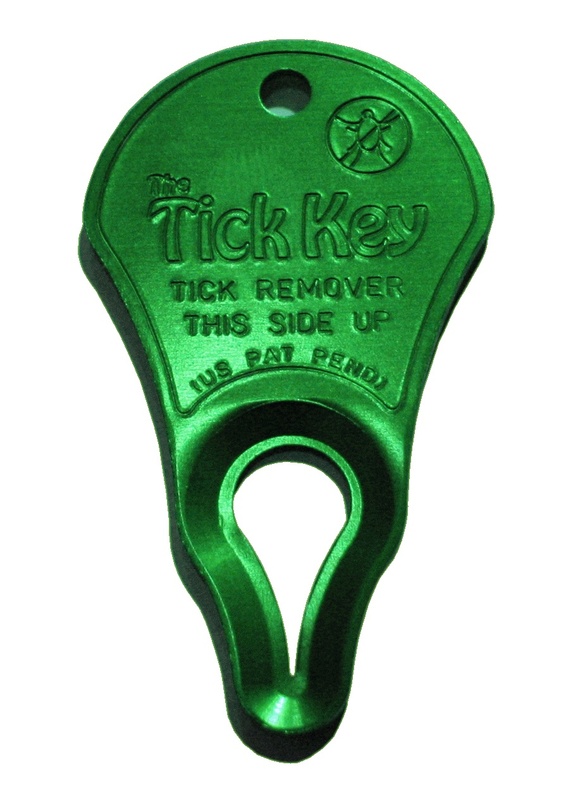 There has been a huge increase in Tick activity the last three years. No one is exactly sure why this is so, but their numbers have increased and even the early arrival times have been pushed up in the seasons. Obviously from our May 11th Hike experience with a Tick, they are no longer appearing in the late summer when it is much warmer and humid outdoors. What ever the reasons maybe, it is always a small task, taking little time, to check yourself and Doggie out, after any venture into the local Parks and Trails. If you think because you are on a Bike, you cannot get a Tick, that is not so. They will drop from a branch or jump up from a bush or the ground and still attach themselves to you. So ANY trip to the Trails requires a quick check for prevention. 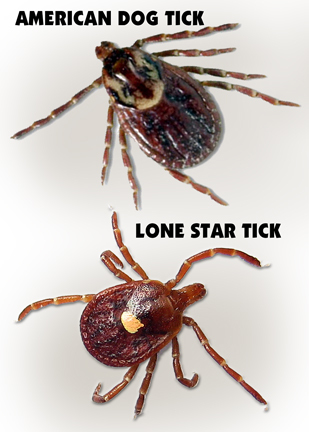 Download our TICK ID Sheets and get some of the basics on Tick ID and proper removal. Proper removal is very important if you do find a Tick on yourself or your Doggie. 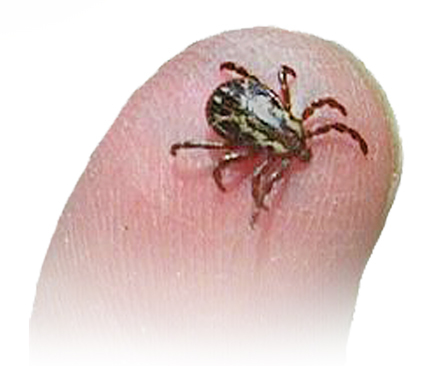 Our Friends with the North Country Trails have recommended an excellent web site for IDing and removing Ticks. Check out this web site here. This is another excellent site for prevention of Tick Bites altogether. CDC Tick Prevention. 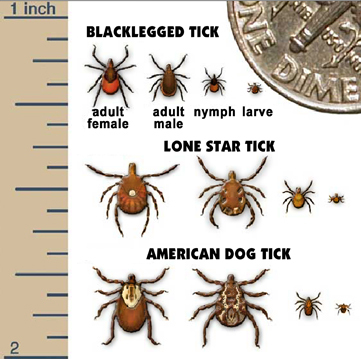 A great ID Info sheet on Michigan’s most common Ticks is something everyone should read. 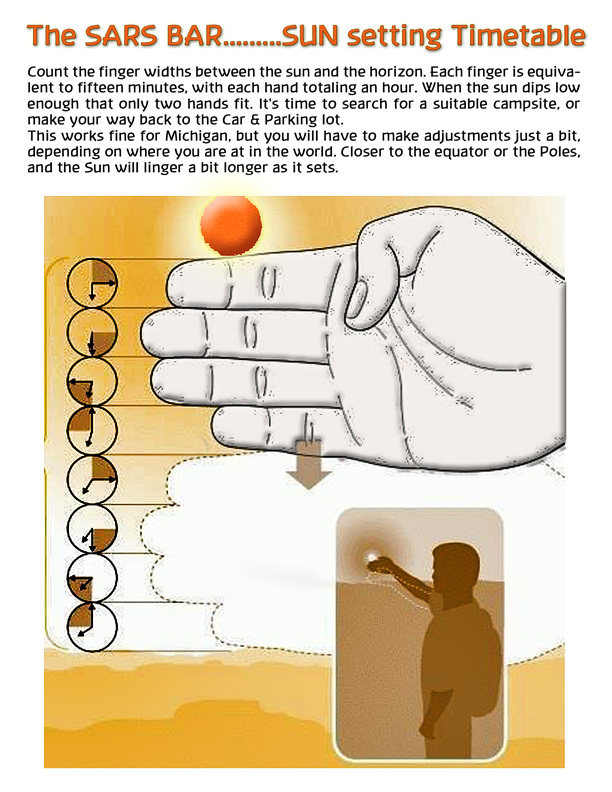 You can download this PDF file here. Michigan Common Ticks. There are just so many different kinds and types of Mushrooms out there. All kinds of colors, shapes and sizes. I love examining every Mushroom I come across out on the Trails. But I follow a VERY IMPORTANT RULE. Never eat any Mushroom you find, while out in the field. Even most of the very experienced Mushroom Hunters will follow this Rule. 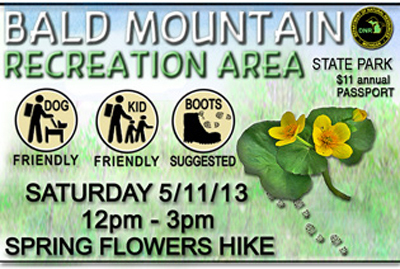 I have Hiked many times with the Michigan Mushroom Hunters Club, and they repeat this Rule, over and over again. There are so many look-a-like mushrooms out there. Some are edible and a very similar looking mushroom can be deadly. The only true way of determining the identification of a mushroom is with a Spore print. This requires one to take that mushroom home and do a short test on making a print of the mushroom and then matching that print to a known print of a specific mushroom. Like a finger print, a mushroom spore print will positively identify a specific mushroom with out a doubt. The difference maybe an enjoyable, tasty meal, or sickness and possible death. Do not play around with identifying mushrooms. An interesting thing you may come across if you are lucky enough, is what is called a “Fairy Ring”. “Gilled” mushrooms and some Puff Balls will grow in an Arch form or in a complete circle. It is an amazing sight to see a natural growing plant, that has formed in some cases, a perfect circle. All the mushrooms grow in that circle and that is it. They are not spread out randomly, all over the area, but rather, they grow just next to one another to form this almost perfect circle. 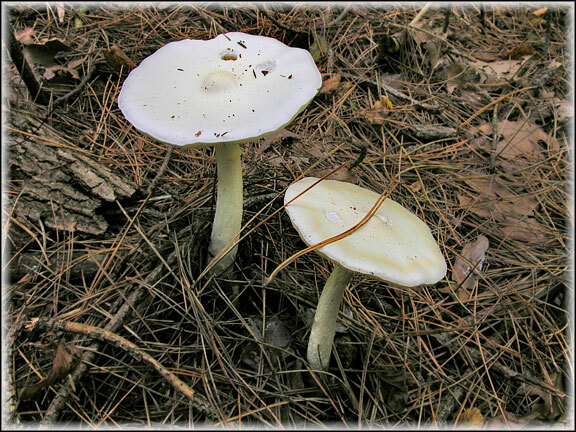 The old story goes like this……..Fairies grow these certain Mushrooms in these secret, perfect circles. A Troll will bury his gold treasure at the center of these rare circles. The Fairies guard the circles and the Gold buried at the center of these circle, for the Trolls. Should a human discover one of these perfect mushroom circles, we have two options. One is to go to the center of the circle and dig up the Trolls Gold buried there. Be careful, because the Fairies are guarding this Gold for the Troll. Your second option is to leave the Trolls Gold alone, and he will grant you one wish. You are to go to the center of the Fairy Ring and close your eyes, while you make a single wish. You then must leave the area and not reveal the mushroom Fairy Rings location to anyone or the wish will not come true. And you will have to be very careful whenever returning to that area of the Forest, for those Fairies will remember that you have broken the trust of revealing the location of the Ring to others. This is how the old story goes. The biggest problem is in finding one of the perfect circle Fairy Rings. There are many semi-circles, and Arches and partial circles out there. these are Fairies busy at work completing the full circles. It takes many years to perfect a perfect Fairy Ring circle. But when once completed, the Troll will then bury his treasure there, and not until then. What do I need to go Hiking? 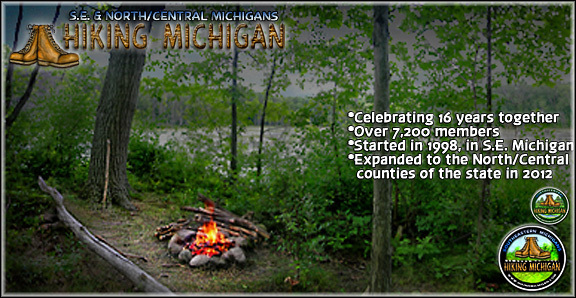 There is not alot you need to get out on the Trails and enjoy some of the wonderful places in Michigan. Mostly it gets down to YOUR personal critter comforts. The things that help make a Hike more enjoyable, a bit easier and of course more comfortable for YOU. 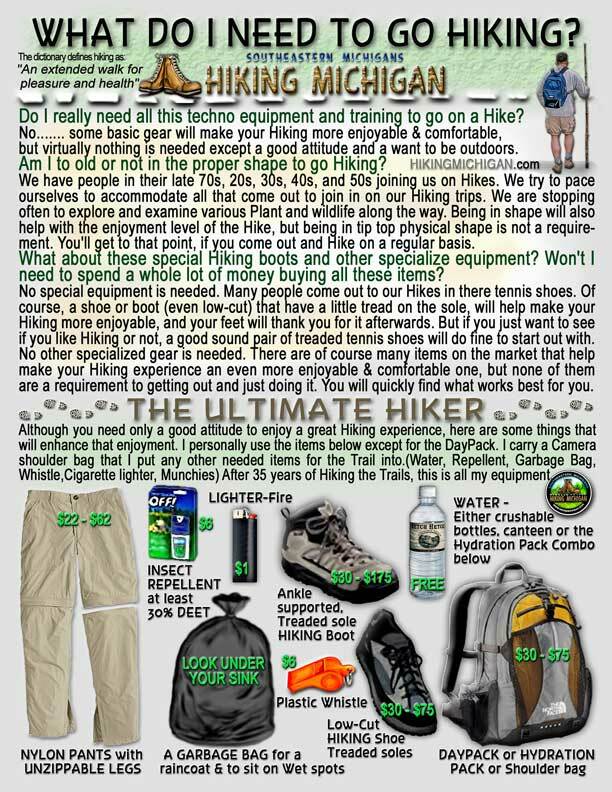 There are a couple of things that every Hiker should have though. The big one is a good pair of Hiking Boots. The kind you select will again, be fitted for your personal needs and feet. Some people like a very lightweight, low-cut boot. Others like myself, need the ankle support and I wear a boot that extends over my ankle bone to give me the extra support I need on the Trails. The best way to find what you like, is to wear a pair of running or Sports shoe and observe what would be need for YOU, out on the Trails. 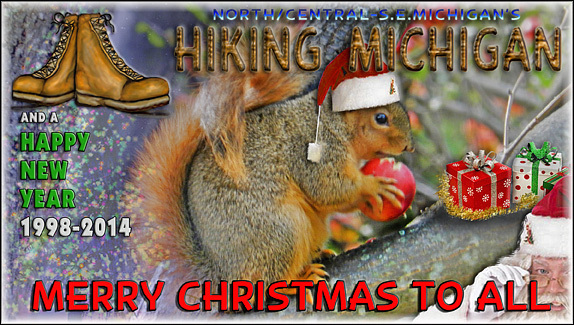 Join in on one of Hiking Michigan’s Hikes and you will also get a good idea of many different types of Hiking boots. The other Hikers will share their experiences with you, on what works best for them. You then can better select a boot just for you. Check out a Blog posting we have done on selecting the right Hiking boot for you. Waterproof boots? heavy treaded soles? Low-cut? High-cut? What works best for you and the kind of Hiking you will be doing. I stress a good Hiking boot, because nothing will make your Hike more enjoyable then a good boot. It also will be something you will be Thankful for after the Hike. Your feet will not be hurting……No blisters or sore spots……and the Hike itself will be a better one with boots that give you good traction, keeps your feet dry and help in supporting your feet in irregular terrain. Do not forget to purchase a good pair of Socks too. Padded heal and Toes, and quality material will make the good pair of boots even better. Water would be the other necessity for every Hiker, after those quality pair of boots. Being hydrated is very, very important. Even during the winter months, or Springtime, when just because you may not be sweating, does not mean you do not need to be drinking water. Lack of hydration will tire you out much quicker and can also lead to other problems that you just do not need to deal with while having a good time out in the Forest. 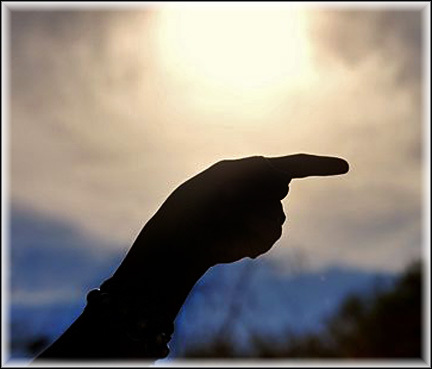 Again…..how you carry that water will be up to what works best for you. Some of us just carry a water bottle. Others like a Hydration Pack. This Pack carries water in a “Bladder”, and allows easy access to a constant flow of water. The small Hydration Pack also doubles as a place to carry any other items you find necessary for a quality outdoor afternoon. For a day Hike, that is about it. Those two items are the main things needed for an enjoyable and comfortable Hike. Then you get into what else would suite YOUR personal comforts. Some people like a snack for the Trails. Others feel the need to have a small supply of survival items. Like a Flashlight, Whistle, extra Insect repellent, change pair of Socks, Hat, gloves. All those little things that add to the enjoyment of YOUR Hike. Mark put together a nice Blog posting on how to stock a Day Pack. Check out that posting here. The best thing to do is to take what you have, and head out on the Trails fro some short Hikes and observe YOUR personal needs while Hiking. After the good boots and water supply, the rest will be for YOU and what best pleases your needs and comforts while out on the Trails. 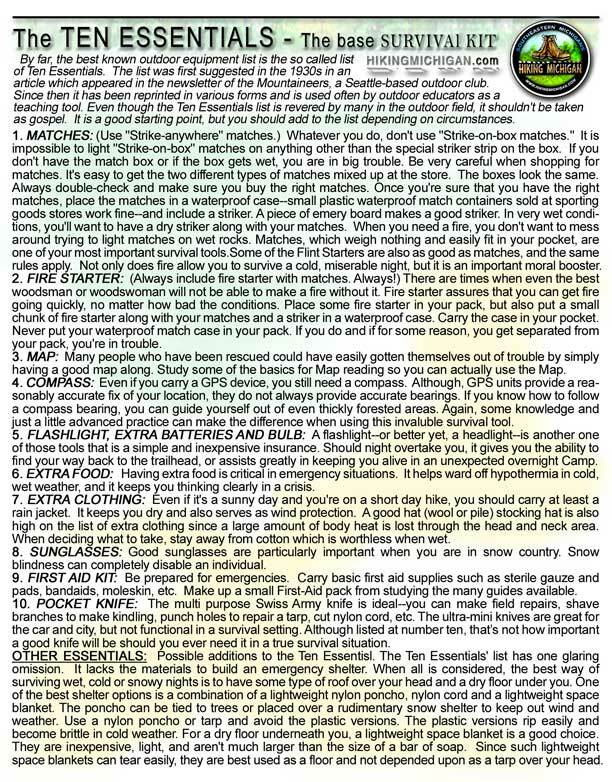 remember that it is worth spending the extra money on quality gear and boots. They will last you forever and the difference in comfort and how they serve your needs are tremendous and worth any extra costs. A big TIP for Hiking is……..do not wear Jeans while doing anything outdoors. The jeans are made from cotton, which absorbs moisture, making the pants uncomfortable, heavier and less accommodating to your movements. A pair of Synthetic material Pants will be worth the investment. There are many kinds of these style of Pants. Some have lower legs that Zip-off. Others have all types of pockets for carrying all those critter comforts you may want. The important point here is……No Jeans while out on the Trails. It will only take one try of a Synthetic material pair of Pants for you to see the HUGE difference in comfort you will experience.